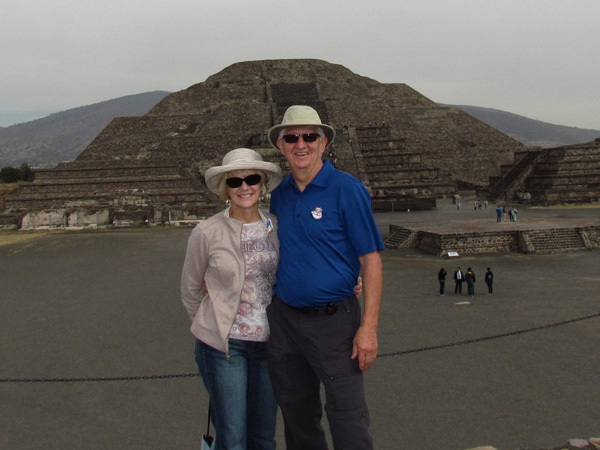 We celebrated both Christmas and our anniversary during a nine-day bus tour of the second largest city in the world--Mexico City. We had high expectation and we were not disappointed. 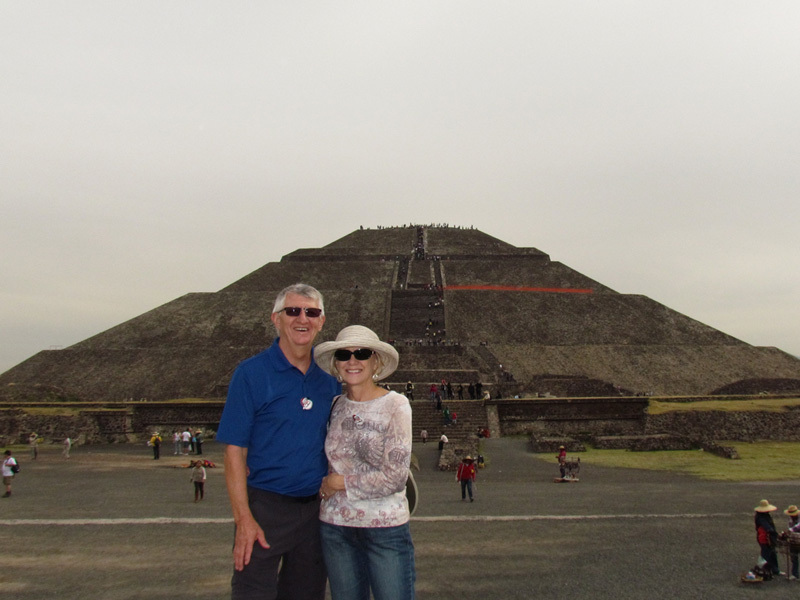 Here we are shortly after climbing over 250 steps to the top of the ancient Pyramid to the Sun. 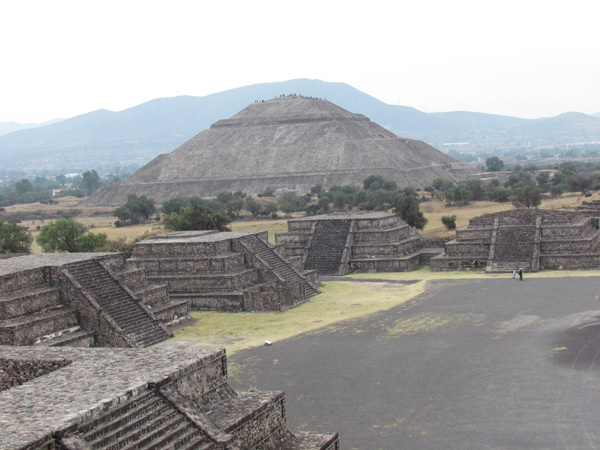 This pyramid is the third largest in the world, built around 100 AD. In addition to all the activities one can participate in here in Ajijic, shopping is not on a "must do" list but it is sometimes a social event. 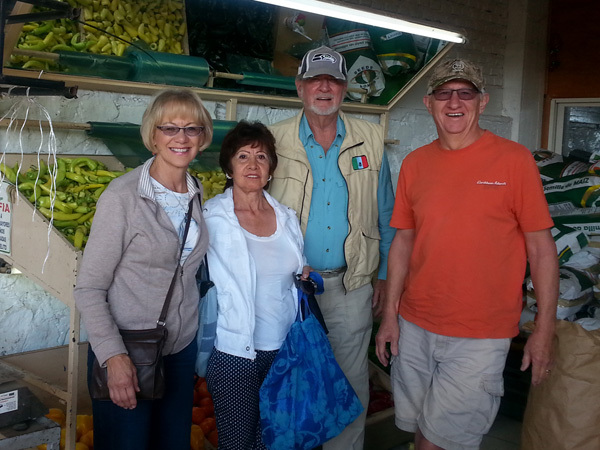 Friends Quinton and Rose joined us on a trip to Costco and Home Depot in Guadalajara. 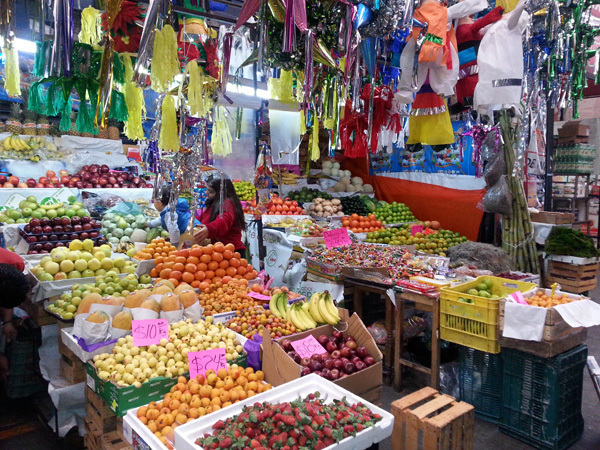 Along the way, we stopped at the ABASTOS warehouses and shops covering 30 city blocks. This is where the pros in the restaurant and grocery businesses come to shop/haggle for everything they need... and it’s open to the public! Friends Lil and Norm invited a group of us over to their home to help decorate this unique Christmas tree. 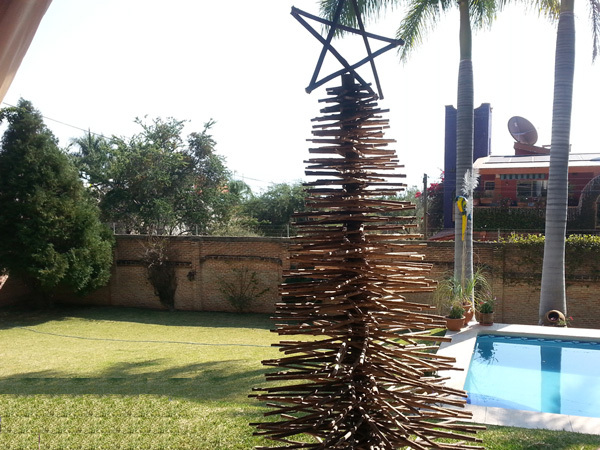 It is made out of sticks of wood, each cut to size. Lil provided the lights and Chuck, Brian and Larry provided the labor. 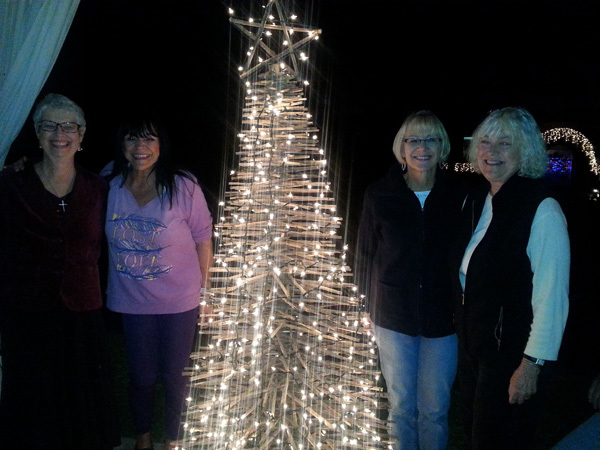 Marilyn, Lil, Glorine and Jean posed with the newly decorated tree, that lights up the evening sky. For all the hard work, Lil and Norm treated us to a great evening of fun including a wonderful dinner. Celebrating December birthdays was a hit. This monthly celebration started with a few friends getting together for drinks and now fills the entire nightclub with people from throughout Ajijic. We joined Jerry and Gloria at Chuck and Jean's house to decorate another unique Christmas tree. It was quite the chore. Jerry provided the treats, sampling his home made brew--Indian Pale Ale and Chocolate flavored Porter. 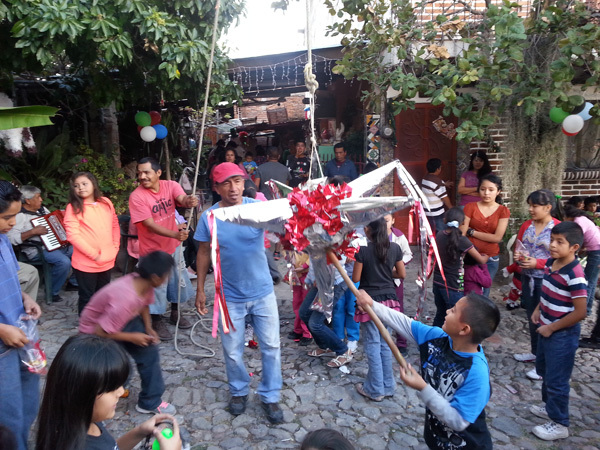 Christmas is a special time of year as neighborhood children dress up and re-enact the Posada (meaning inn or shelter). These little Angels are leading Joseph and Virgin Mary to a Posada. But instead of a place to stay, they found a piñata filled with candy and fruit. This piñata was a gift from Chuck and Jean to their gardener (with the red cap) who hosted the event. The kids had over a dozen piñatas to break. 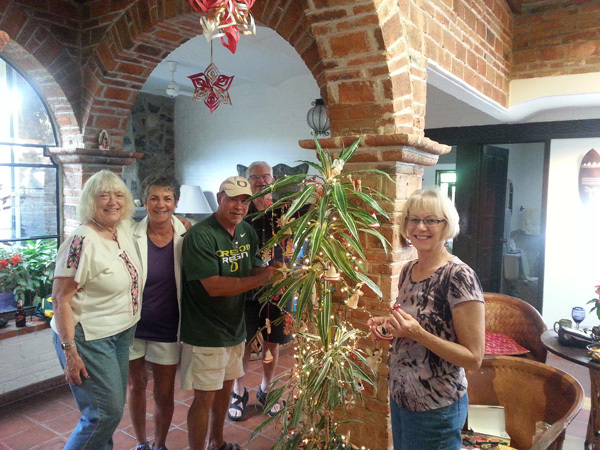 Nearly 50 people joined Charter Tours for their annual nine-day Christmas tour of Mexico City. 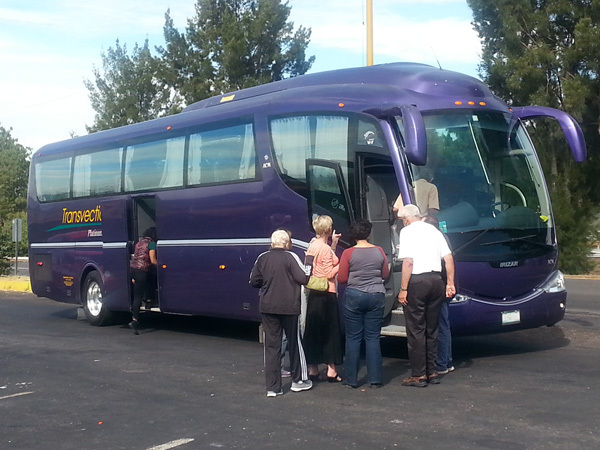 This premier bus is about the same size as our motorhome, but much higher. The seven-hour bus ride included frequent stops and commentary of sites along the way. After a great night sleep in a five star Sheraton, we rode 30 miles north of Mexico City to tour the ruins of Teotihuacan (tea-oh-tea-wha-kahn), a UNESCO World Heritage Site. The Pyramid to the Moon is in the background. From the top of the Pyramid to the Moon, we tried to capture the immensity of this ruin, said to be eleven square miles. The sight was once home to 250,000 inhabitants, which at the time made it one of the largest cities in the world. On the outskirts of Teotihuacan, we had lunch and were entertained by this pre-Columbian descendant. 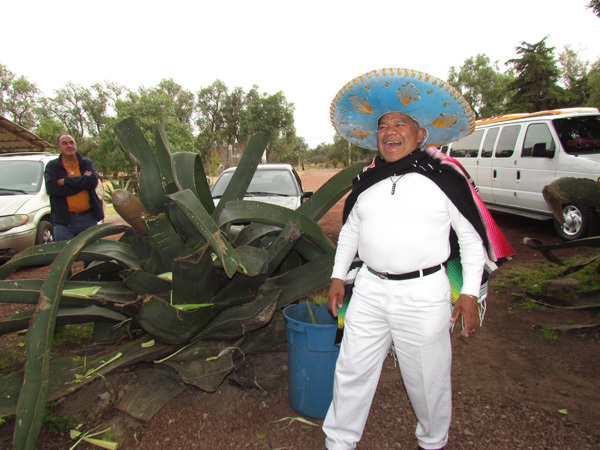 His colorful presentation included the important role of cactus--paper, fabric for clothing and their version of Tequila. 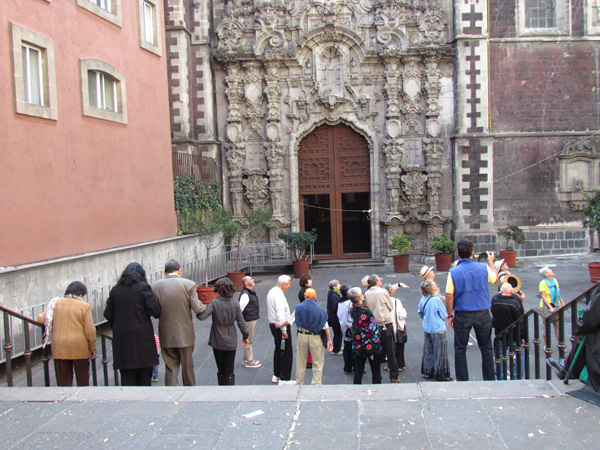 We toured exclusive neighborhoods on day two including Chapultepec Park, initially established in the 1420s by the Aztec Empire, making it the first nature reserve in the Americas and the largest in Latin America. 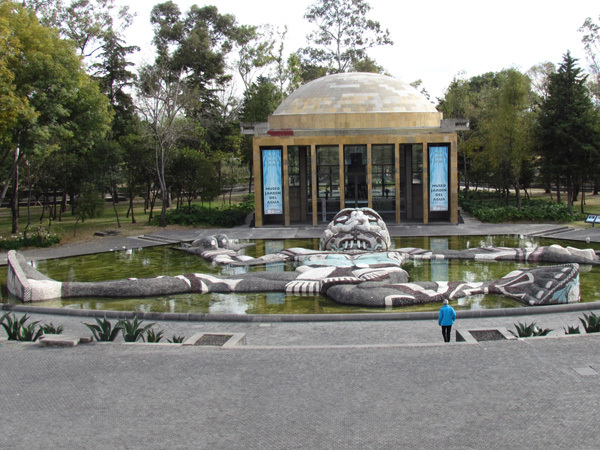 Diego Rivera's sculpture in the Tlaloc Fountain is Cárcamo de Dolores. 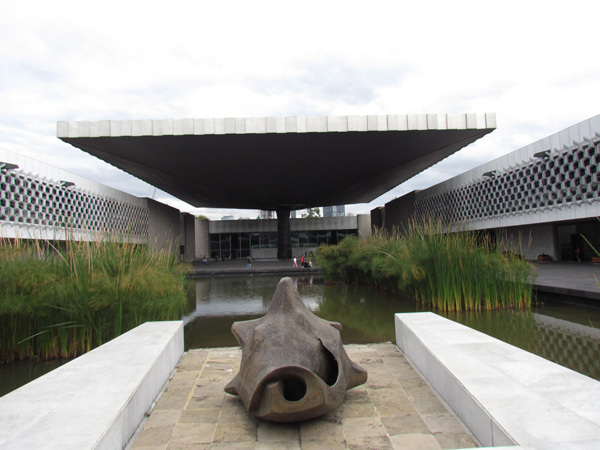 Chapultepec Park is home to the most visited museum in Mexico--the National Museum of Anthropology. The architecture included four exhibition halls highlighted by a courtyard with a huge pond and a vast square concrete umbrella supported by a single slender pillar. 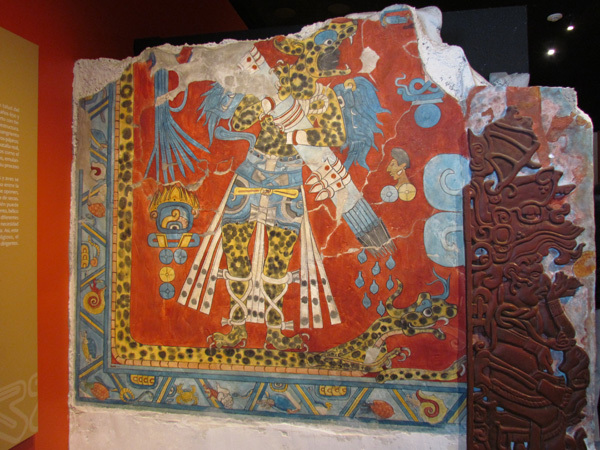 The museum houses the oldest mural painting featuring a human figure and symbols from Mesoamerican periods including Mayan, Teotihuacan, Mixtec, Zapotec and Nahuatlaca cultures. This "bird man" mural depicts the generous deity who taught people the arts and agriculture. Mesoamerica is a region extending from central Mexico to Central America beginning as early as 7000 BC and ending with the Spanish conquest of 1519. 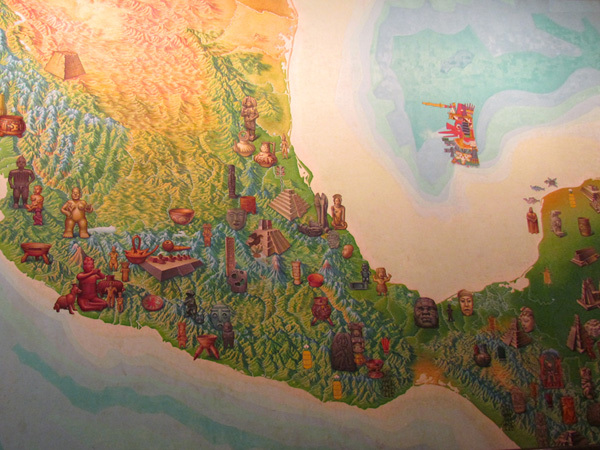 Mesoamerica is considered by archeologists as one of the six major ancient civilization in the world. 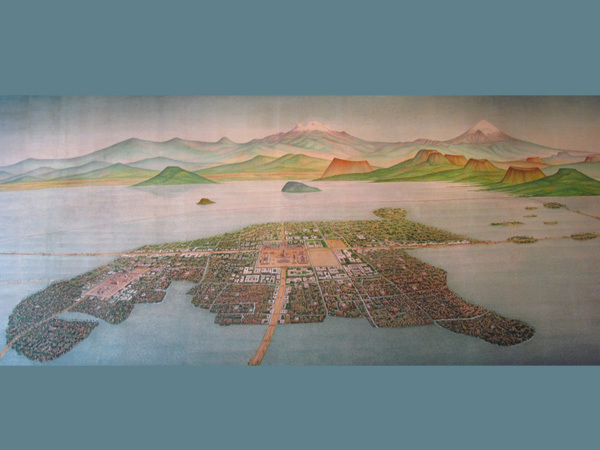 The Aztecs built Tenochtitlan on an island in Lake Texcoco--7,336 feet above sea level. The lake covered most of the high lands of the Valley of Mexico. 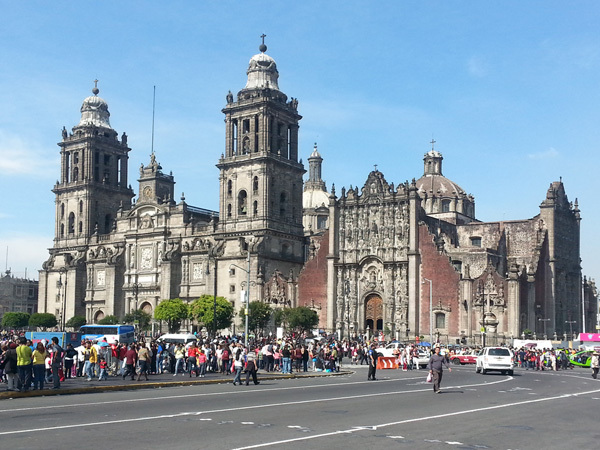 The Spaniards built Mexico City over this city, then drained the lake to expand the city to what it is now. 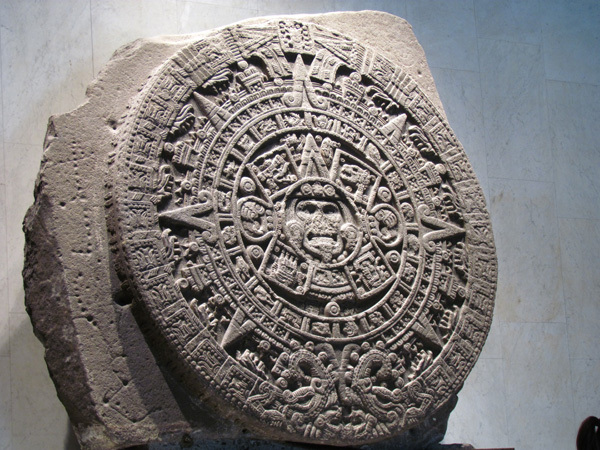 Perhaps the most famous work of Aztec sculpture is the Aztec calendar stone or Sun Stone. It is nearly 12 feet in diameter, three feet thick and weighs about 24 tons. It is considered late post-classic Mexican sculpture and is proudly displayed in the National Anthropology Museum. 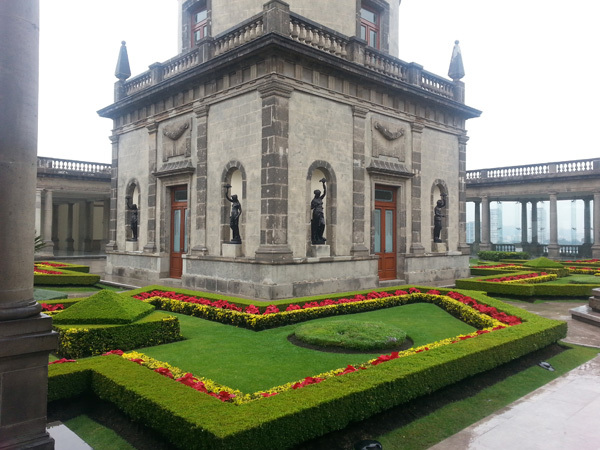 High on the hilltop of Chapultepec Park is Castillo de Chapultepec, an impressive European style castle built in the late 1780 to house the King's representative to New Spain. During the French occupation of Mexico, 1862-1867, the castle became the official residence of Emperor Maximilian I and his wife. 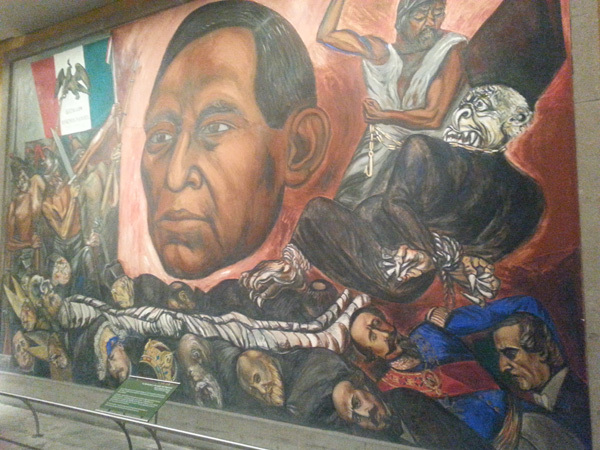 Inside the castle is this mural of Benito Juarez, considered by some as the Abraham Lincoln of Mexico. Juarez defeated and executed Maximilian ending the attempt to establish an empire by France and the Vatican. After confiscating massive holdings of the Catholic Church, ties to the Vatican were severed and not reestablished until 1992. 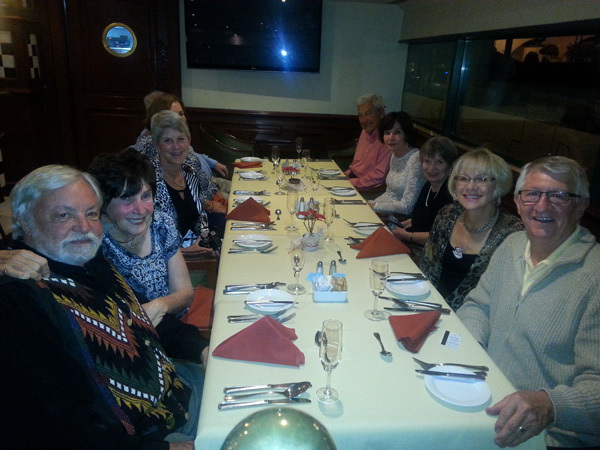 Most of the Ajijic tour group spent Christmas eve dining on the seventh floor of the Historical Zócalo Central Hotel overlooking the plaza in downtown Mexico City. 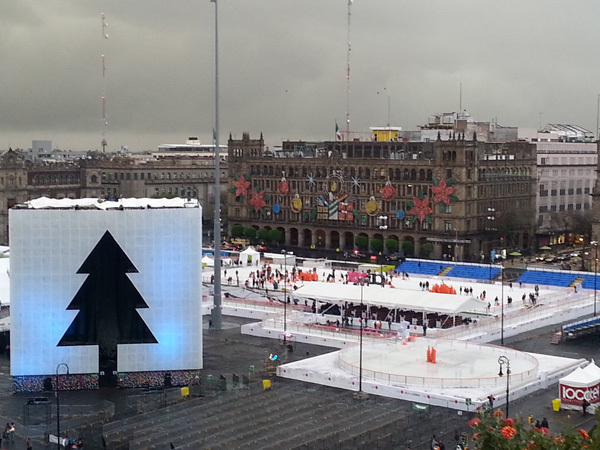 Ice skaters enjoyed rinks in the middle of the plaza, with Christmas decorations adorning city hall. Christmas was day three of our tour, which highlighted The Basilica of Our Lady of Guadalupe--one of the most important pilgrimage sites of Catholicism. 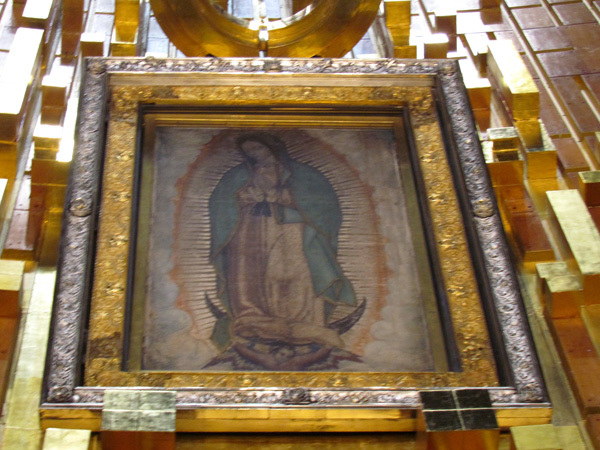 Here in the main basilica is the original tilma (or cloak) of Juan Diego, which holds the image of Our Lady of Guadalupe. Less than ten years after Spain conquered the Aztecs and started converting the native population to Catholicism, Juan Diego, an early convert to Catholicism was said to have an apparition of the Virgin Mary, where "she instructed him to request the bishop to erect a chapel in her honor so that she might relieve the distress of all those who call on her." The site of the National Shrine includes a succession of chapels, shrines, churches and basilicas that was built beginning shortly after the apparition in 1531. 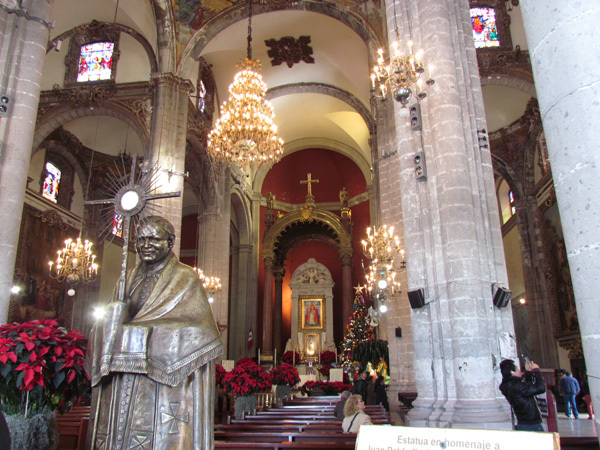 A large Basilica was built in 1701, however, because Mexico City was built on a lake bed, this church began sinking. The newest Shrine is the green Basilica built in 1974 which can hold up to 50,000 people. In 1999, on the eve of the 2000th birthday of Jesus, Pope John Paul II, the first pope to come to Mexico, celebrated mass at the Shrine. 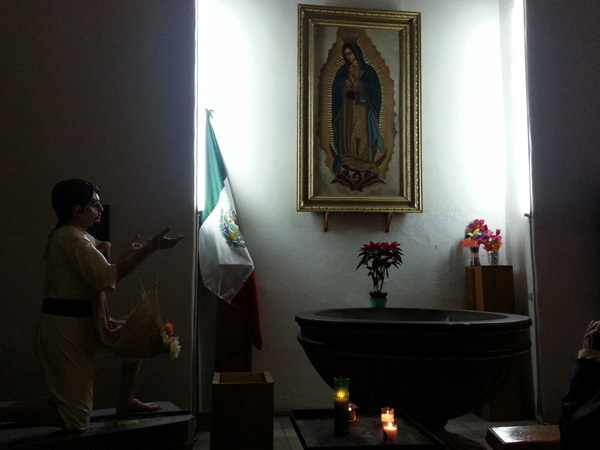 With 85 percent of Mexicans being Catholics, the location was perfect. This is one of two bronze statues of him on the grounds of the Shrine. The Charter Tour of Mexico City included complimentary breakfast each morning and a Christmas dinner in the dining room of the Sheraton Hotel. We knew four people before the trip and now have a bunch more we can call friends. This massive complex includes the Polyforum Siqueiros Museum in the foreground and the World Trade Center, hotel and a revolving restaurant in the background. 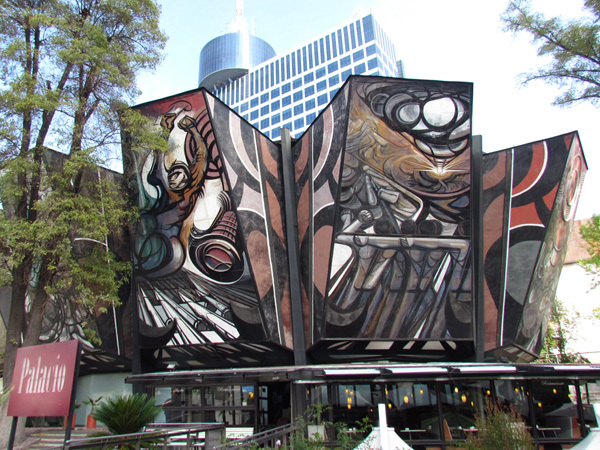 The Polyforum consists of twelve outer panels totaling 8,700 square meters of murals called the "March of Humanity." 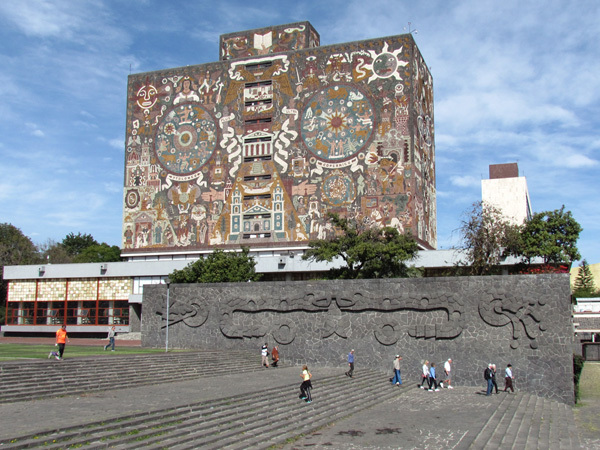 The National Autonomous University is the largest university in Latin America and the oldest in North America--founded in 1551 by the Catholic Church. It closed in 1867, with the confiscation of Catholic holdings by President Juarez, but reopened as an independent secular university in 1910. The 1968 Summer Olympics were held in Mexico City. 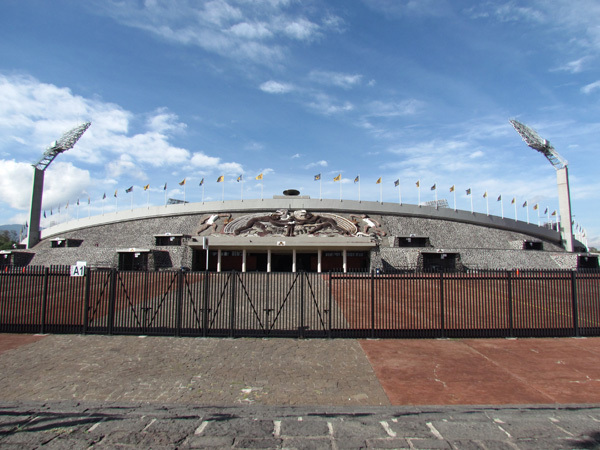 This University stadium held many of the venues, where Mexico won 30 medals. We learned that 10 days before the games, over 30 student protesters were killed and thousands arrested. News of the event was covered up for 30 years. With 20 million people, Mexico City is administratively divided into sixteen boroughs. 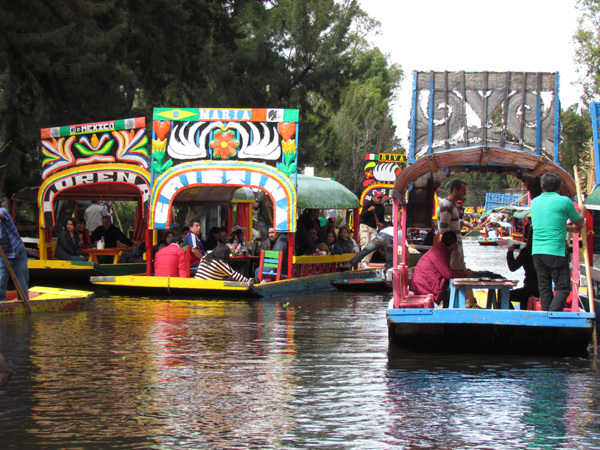 Xochimilco is best known for its miles of canals that were once used to connect the settlements of the Valley of Mexico. Today, it is used mostly to move tourists around in these colorful gondolas. 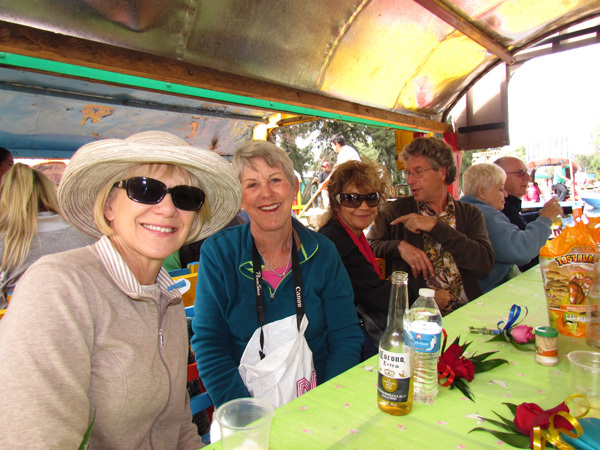 Here is Glorine with Karen, Pat and John, along with six others on the tour who enjoyed a snack as a Mariachi band serenade us on our cruise on the canal. 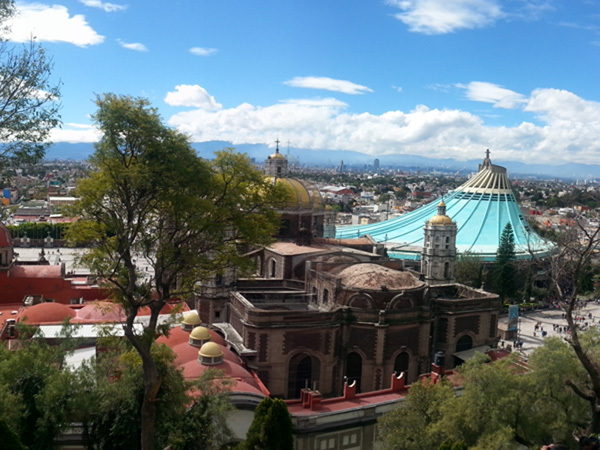 Onto the borough of Coyoacan, home of famed artists Frida Kahlo and Diego Rivera. In the town center was the Church of Saint John the Baptist. While the exterior was quite drab, the interior was impressive with exquisite murals lining the walls and ceilings. 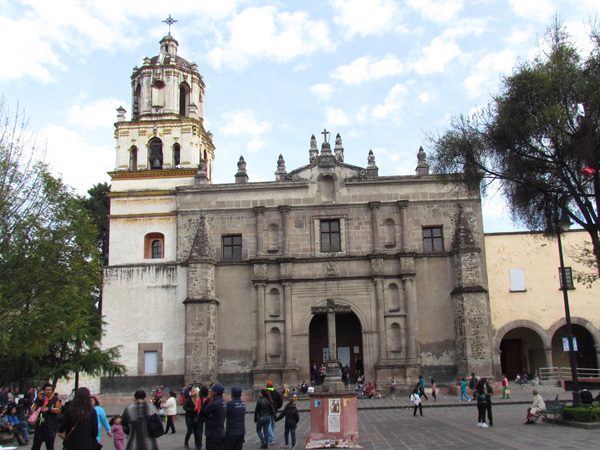 It was one of the first churches built in Mexico following the fall of the Aztec empire. Our last day on tour was spent in the city center. The Church of San Francisco, a 350,000 square foot monastery used as the headquarters of the first twelve Franciscan monks sent by the Pope to evangelize in New Spain. 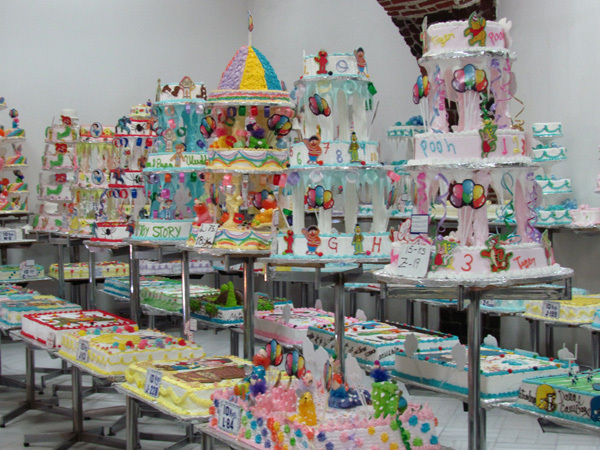 We toured this pastry shop consisting of two floors with rooms filled with displays of every kind of birthday, wedding, anniversary cake imaginable. 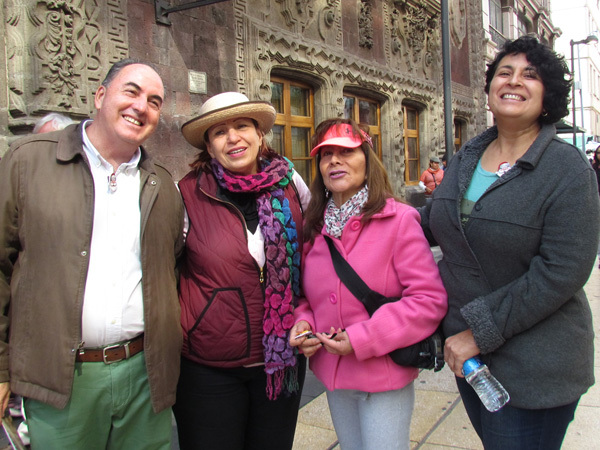 Our tour guides, Carlos, Julian, Elivina, and Rosie posed for this picture as we walked along the streets of downtown Mexico City. They were great! We stopped for coffee and pastries at this unique hotel/restaurant. It was hard not to get disoriented. 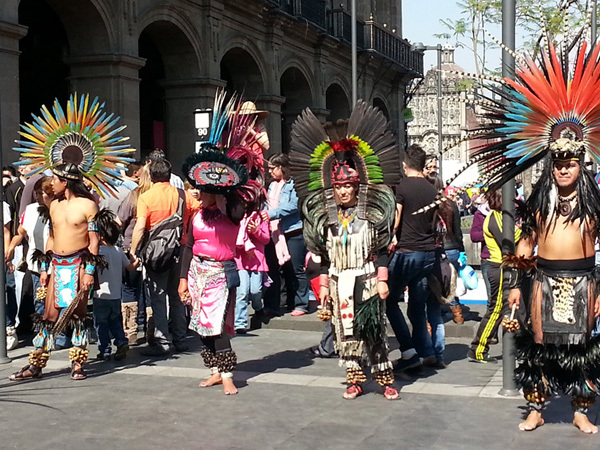 We happened upon these colorful dancers performing some traditional Aztec ceremonial music and dances. 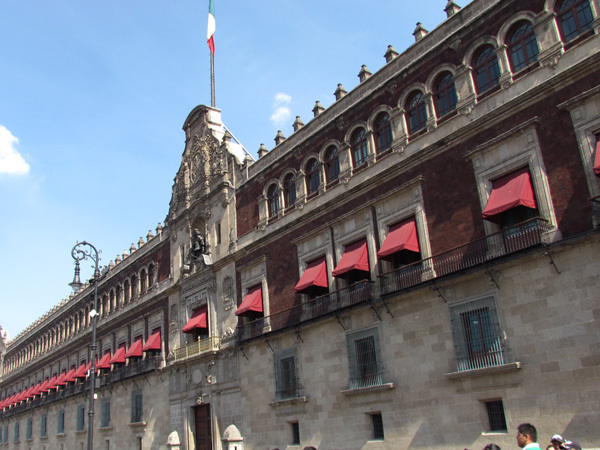 The National Palace has been used by the ruling class of Mexico since the Aztec empire. The original bell Father Miguel Hidalgo (recognized as one of the founding fathers of Mexico) is rung each September 27th to celebrate the end of the rule by Spain in the territory now known as Mexico. 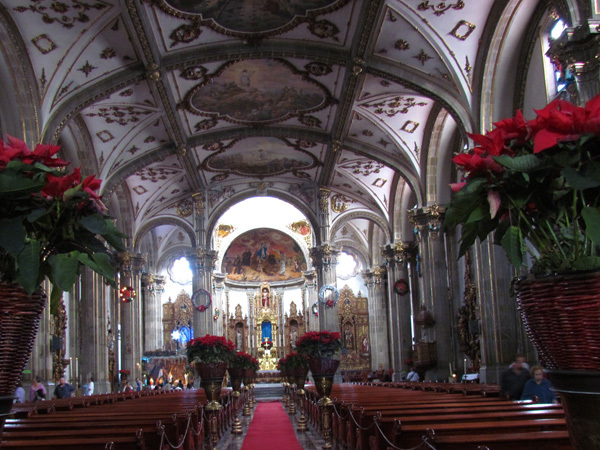 The Metropolitan Cathedral of the Assumption of Mary is the largest cathedral in the Americas and home to the Archdiocese of Mexico. It is made up of a main Sacristy, two alters and sixteen chapels. It was built in the late 1500s atop some of the former Aztec sacred sight known as the Templo Mayor. 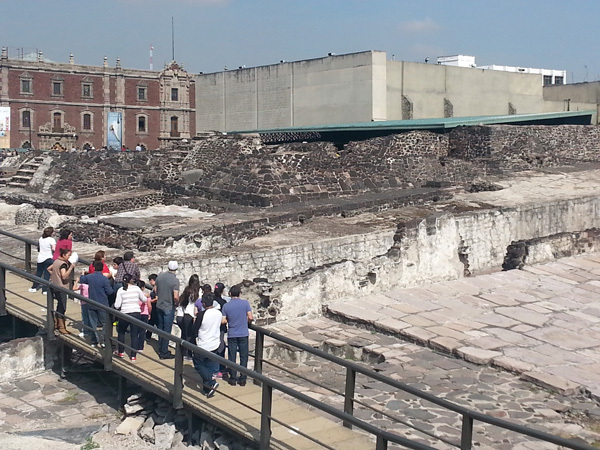 Near the Cathedral are the remains of The Templo Mayor (Great Temple) one of the main temples of the Aztecs. It was constructed after 1325 and destroyed by the Spanish in 1521. 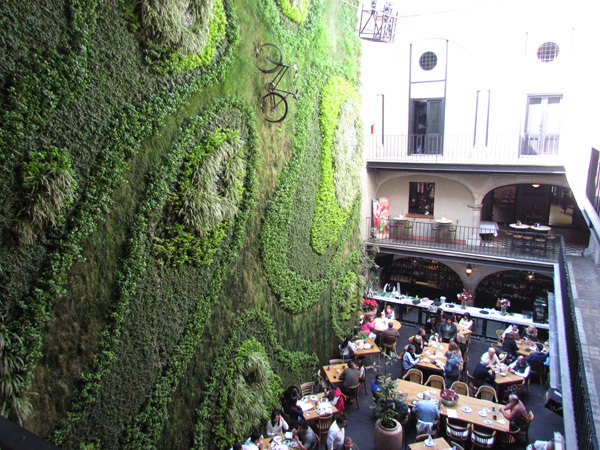 The site is part of the Historic Center of Mexico City and listed as a UNESCO World Heritage in 1987. Sunday, December 28, was the last day of our tour and with no scheduled events. 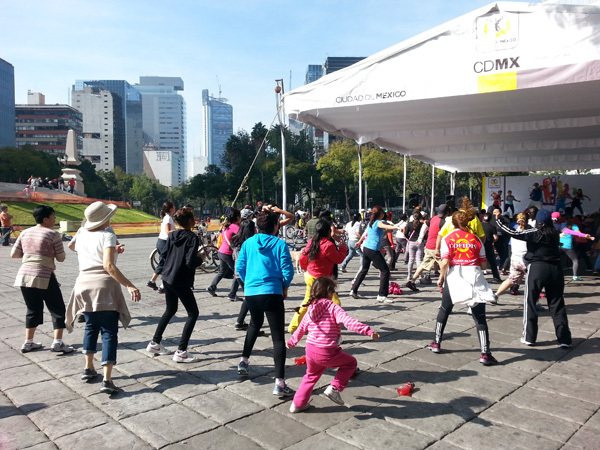 Avenue Reforma was closed to vehicular traffic and opened for runners, rollerbladers, bikers, etc. This awning was set up in front of the hotel and overflowing with people doing Zumba. 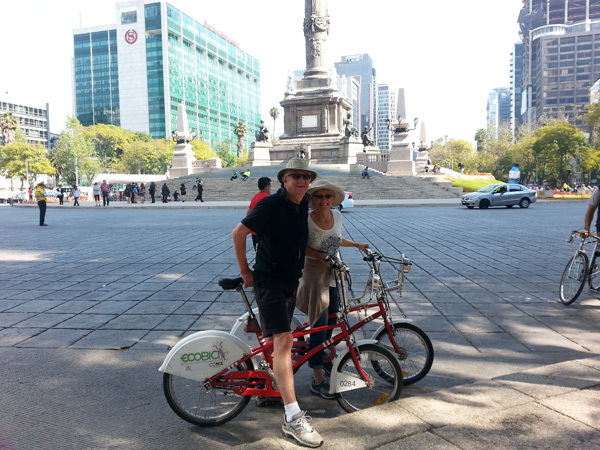 We rented these bikes to ride along Avenue Reforma that runs diagonally across the heart of Mexico City from the city center to Chapultepec Castle. The round-about in the background includes the famous monuments of the Paseo - the Angel of Independence - built to commemorate the centennial of Mexico's independence in 1910. After riding past the city center, we followed other bikers (not really knowing where we were going). 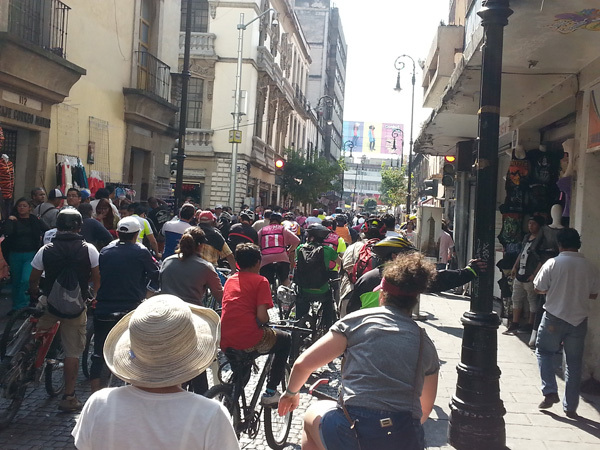 When we found out these bikers were going back to Reforma Avenue, we kept riding. After five miles or so, we inquired "how far is this bike tour?" We were told it was 35 kilometers. 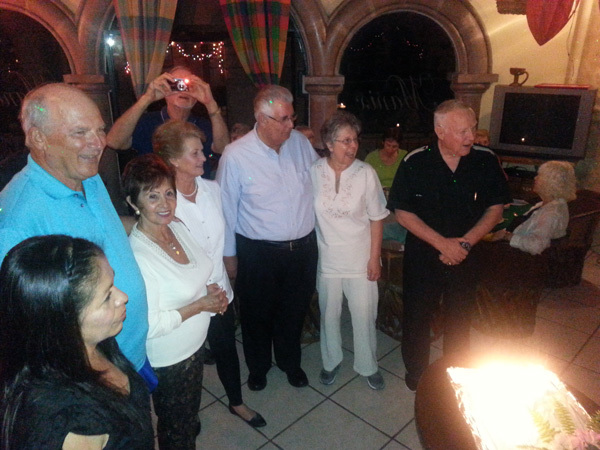 What a way to celebrate our 46th anniversary! 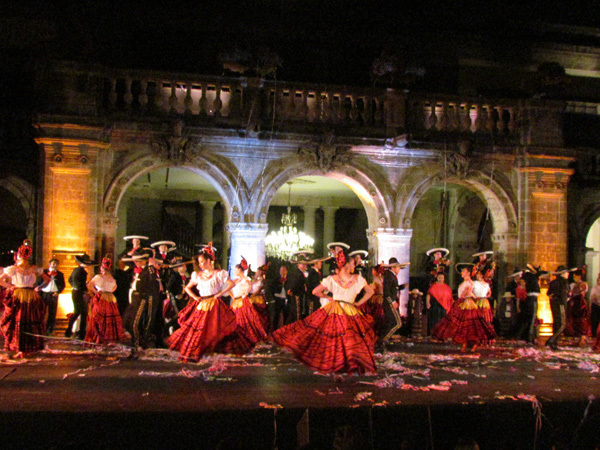 Our last night in Mexico City was spent back at the Chapultepec Castle for an outdoor Ballet Folkorico with a Nativity theme. A donkey carrying Mary, horses carrying the three kings, along with sheep and cows shared the stage with some of the most awesome dancers. 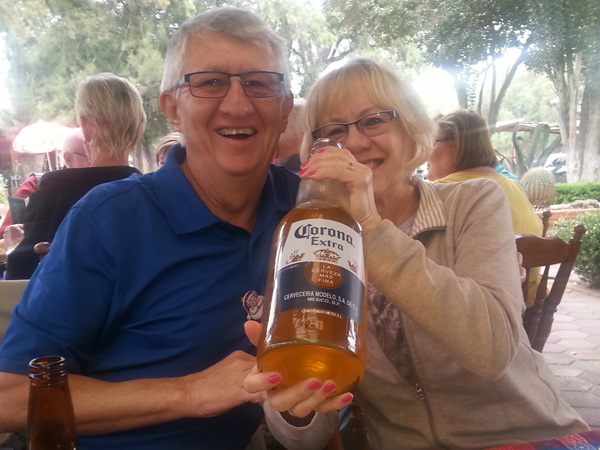 During our tour, we learned a new version to a traditional Mexican toast. "Salud, Dinero, Amor, Arriba, Abajo, Al Centro y Pa' Dentro." In English it translates to HEALTH, WEALTH, LOVE, UP, DOWN, CENTER, and INSIDE. And so we toast to a wonderful 2015!